Many times, a cavity can be forming between your teeth, and a regular exam might not catch this potentially serious issue. A dental x-ray from our team at Emerald City Smiles can provide a more detailed overview of your teeth. These are widely considered routine and are an essential part of routine dental care. 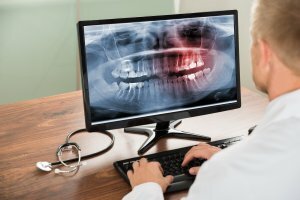 As a holistic dental care provider, we only use digital x-rays, as opposed to typical analog x-rays. We care about our patients’ health and want to provide the safest and most effective x-ray services possible. If you want holistic and thorough dental care in Mountlake Terrace, look no further than Emerald City Smiles. When most people visit the dentist, they think about going in for a cleaning or to have a cavity filled, but x-rays are an important part of thorough and effective dental treatment and screenings. Your dental history and health will determine how often you need to undergo dental x-rays. Some patients need imaging done every six months, while other patients can go years without an x-ray. Thanks to technological advances in the x-ray world, our patients no longer have to undergo traditional analog x-rays when visiting our office. We strive to provide the best treatment for our patients. This means providing the safest and most convenient treatment options. There are all sorts of benefits to using digital x-rays. First, these x-rays provide crisp and clear images. These higher-quality images make it much easier to provide proper diagnosis and care for our patients. Unlike analog x-rays, which require multiple pictures from the same position to confirm the produced image, digital x-rays only require a single image. This makes the process much easier and less time-consuming for both patients and dentists. The produced image is also available instantly. Traditional x-rays require film processing, which takes much longer than instant exposure. Because digital dental x-rays are much faster than analog dentistry, you can be in and out of our office in no time at all. We’ve all heard about the dangers of too much exposure to radiation. Because we’re exposed to radiation on a daily basis, it’s best to minimize further exposure as much as possible. One of the biggest benefits of using digital x-rays is that they use almost 90 percent less radiation than typical film x-rays. This protects a patient’s health, while also minimizing the risk to the dental assistant who is taking the x-rays. With low-dosage radiation x-rays, you can undergo a dental x-ray without worrying about the health risks of x-rays such as DNA damage or even an increased chance of certain types of cancer. For all of your dental needs in Mountlake Terrace, you can come to our office. At Emerald City Smiles, you can count on a team of caring dentists and assistants who want to keep your teeth happy and healthy. To schedule a convenient and fast dental x-ray with our dentist, give us a call at (425) 775-3446.